In early 2013 HPV released the Scorpion FS 26. Having prior experience with the Scorpion FS 20 improvements were made from stem to stern including front suspension geometry, a totally new frame, and for those with an appetite for a boost, a radical new electric drive assist system. One short test ride and we were bitten with the urge to order a pair of Scorpions. The two piece Bodylink Seat is well known for its orthopedic design and rider height adjustability feature. Customization includes suspension tuning, seat position, crank lengths and more so it really makes better sense to order one rather then buy it off the showroom floor. We searched across the country for the best dealer to work with. After several calls to various dealers Zach Kaplan Cycles of Alameda was by far the most impressionable. Zach's knowledge of HPV's and what's required to custom configure the trikes was straight forward and concise. His attention to detail is thorough and his commitment was above and beyond anyone else we spoke with. Using the HPV Configurator we spec 'd out a pair of FS26's and retained the configuration number for both, and 5 weeks later two boxes arrived. When you first get the package from HPV your first impression is that one of the packages must have been lost in shipping. HPV ships everything across the pond by air and the packaging job alone is impressive. Everything is wrapped with a "grippy-back" bubble wrap so no metal parts will rub in shipment. Zach Kaplan installed the Bottom Brackets for the daVinci cranks and was instructed to ship the trikes un-assembled. Idlers on both trikes required an .040" shim to line up the chainline with the chain tubes. One of the bells had been broken probably in shipment. From the factory alignment was dead-on. It took a total of about 12 hours to transform 2 boxes into fully assembled trikes, complete with basic fitting to the riders. Using ICE accessory mounts for the computer heads, some brackets were fabricated to mount the magnet transducers to the fender mounts. We don't need fenders. At first, hers was built up with a spare Nuvinci N360. Having smaller hands she had some trouble getting used to the grips so we installed the SRAM DD2. SRAM internal 3 speed has a unique cable pull so we were stuck with the OEM twisty. That turned out to be a good thing as we installed a set of Trigger Shifters at the tops of the bar. It took about two months of adjusting padding until she declared the seat to be perfect. HPV offers forward biased seat mounts that move the seat forward about an inch. Her preferred position is with the seat bottom at the top position and the seat back all the way forward. The Bodylink seat is unique in that the arch of the seat back is adjustable by positioning the 3 point mounts. Having the softer suspension the rear spring was tightened just enough to offset any rear pogo in the lowest gear, which didn't require much preload. After a bit of riding she wanted another half turn of preload to give it a little more of a solid feeling. The front suspension is adjustable and required about 30% pre-load to dial out front pogo. His was set up with the Nuvinci N360 and a Shimano 7 speed derailleur as a chain tensioner. Both trikes have 26/39/52 chainrings on front with a Microshift derailleur. If you install a front derailleur you'll need to add a clamp-on cable stop as the Derailleur post is not provisioned with one. Originally equipped with Big Apples we had a pair of Trykers and a 26x1.5 Marathon Racer that were later mounted and will probably stay on for a while. The suspension is good enough that we may try some all out road tires like the Continental Gran Prix's. Fitted with a basic Pannier set the OEM recommended Moonbiker bags are a lot more aerodynamic and may be ordered at a future date. A phone bag and tool accessory bag was added as the Bodylink Seats have no pouches. Equipped with the medium weight springs was a perfect match for a 200 lb rider. The stiffer anti-roll bar is the same outer diameter as the standard, with more wall thickness, and powdercoated in gray opposed to the standard bar white. It took about 1/2 turn of pre-load to dial out the rear pogo, and about 50% front preload to keep the front still during pedaling. Dialing out front and rear pogo makes a very noticeable difference in power input. In the first 50 miles it felt like the trikes had quite a bit more drag then the Catrike Expeditions we had in the stable. Aerodynamic drag is higher then the aero drag of the Expedition. Wheel track measures an inch wider with artifacts like the lower control arms and larger mirrors that are simply a bigger fist to punch through the air. These mirrors are large and give an excellent heads-up view of the road behind. The first time I sat in this trike it made me feel that every other tike I've sat in was just a toy, and this HPV FS26 was the real thing. It almost gives you a reflex action of inserting a key to crank it up! After getting the suspension finely tuned, the seat padding perfected and general break-in the FS26's proved to be a little faster on climbs with average speeds on consistent routes to be equal to the Catrikes. While some have mentioned that they find the FS26 to be a little slower average speed then the Expedition it may be possible that they never really took the time to properly dial in the HPV. You may have noticed the Catrike Neckrest. Its mounted to a Tee shaped SS304 bracket I cut on the laser. HPV also has grommets in the frame tube for internal wiring. These speed comparisons aren't the result of some empirical data experiment so take it however you like. The FS26 weighs in at about 50 lbs with the N360 & panniers, where the Expedition weighed in at about 43 lbs. It would seem that hauling the extra 7 lbs up hills would be a little more of a struggle, but the FS26 just loves to climb. That's probably due to the properly fitted Bodylink seat and the extremely rigid Boom. There is practically zero flex in this large diameter tube Boom. Frame tubing OD on HPV's has always been a bit larger then the average, and at 2-3/8" the FS26 is the stiffest in the industry. The McPherson strut front suspension works extremely well with the new geometry. Earlier versions of the FS 20 had a perceivable lag on the turn-in however this newer design has virtually no lag. Grip level is incredible as is stability. Steering feedback has one-upped the most sensitive direct steering systems. You really have to push it hard to lift a wheel and thanks to the balanced anti-roll bar, the reserve left when you do lift a wheel is amazing. Part of the stability is due to the Bodylink seat and well positioned handlebars which allows the rider to readily lean deeply into a turn. Test rides with the Mesh seat revealed that the Bodylink provided a natural feeling motion to lean where the Mesh seat makes the rider lean a bit forward before leaning in. Fitted with 1.5" Trykers up front and 1.5" Marathon Racer in back doesn't force you to back off the pedals, let alone brake, when coming up to railroad tracks. Keep the speed on and the suspension takes the bumps leaving the tires and rims fully intact on bumps that would snakebite the tubes on a rigid frame. High frequency terrain like chipseal pavement is muted but still felt with 1.5" tires. With Big Apples the pavement buzz of chipseal is eliminated. 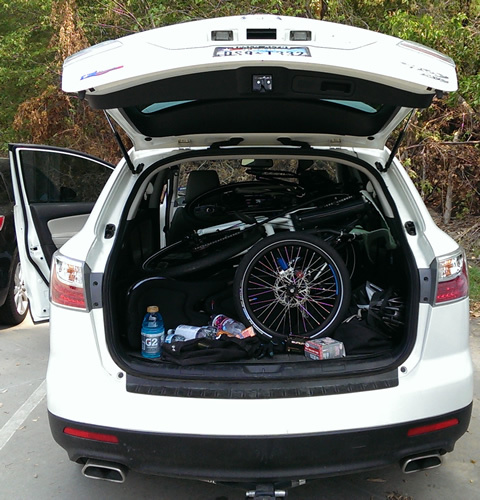 The long wheelbase eliminates Stoppie's. The front tires will lock at any speed before lifting the rear tire off the ground. 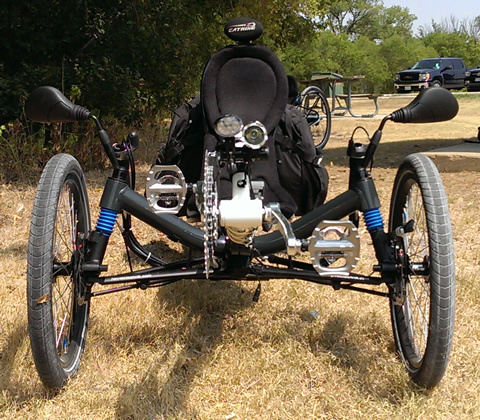 Moreover the downhill stability at high speeds provokes confidence that would fade at 20 MPH lower on any rigid frame trike. No more will the rider be aiming for the slot between the bumps at the bottom of a long steep hill. The folding feature of the FS26 is a blessing when you have 2 trikes to transport. Just as HPV states, it takes about one minute to remove the seat, unlock the hinge, fold the trike, and wrap the Velcro strap to tie the trike into a folded position. Likewise peel away the velcro strap, open the trike up, pop the hinge hasp, close the Quick Release, and mount the seat takes about 2 minutes. Build quality is second to none. Welds are consistently smooth and clearly the work of an artisan. Front kingpins are precision machine pieces of lightweight yet robust aircraft aluminum. Powder coating is super hard yet has a brilliant luster. Thickwall clear tape is applied to places where chips might occur such as along the chain axis on the Swingarm, and at places where the folded trike may touch. Logos and graphics are stenciled on under the super hard overcoat so they won't peel off. Most fasteners are lubricated with torque specifications given in a lubricated state. The owner's manual is comprehensive and designed to inform the owner and mechanic on how to maintain perfection. At about 400 miles one of the bolts that holds the right front wheel on came loose. It was properly torqued at assembly and considering this trike sees some G-forces in turns, it may have worked itself loose as a result of riding. There have been a few other reports of this happening on fairly new FS26's so its strongly recommended to check torque often. In our case it will be every 100 miles. The luxurious ride of the HPV Scorpion FS26 comes at a steep price, starting in the mid $4000 range its pretty easy to push the delivery price into the $5000-$6000 range. Its not the type of trike most first time buyers need, but for those hooked on riding 3 wheels its about as sweet as it gets. As far as options go, most people tend to prefer the ErgoMesh seats over the Bodylink. Among all the Mesh seats I've been on, the ErgoMesh is by far the best, with the ICE Mesh seat a close second. HPV also offers an XL seat that's contoured for riders with a belt size over about 42". If you ride with the seat reclined you'll almost definitely want a Neckrest, however with the seat tilted forward you probably won't need the Neckrest. Crispy Steve lists a Neckrest on his Finer Recliner website and usually the Hostel Shoppe has them in stock. Riders shorter then 5'-5" will very much appreciate the forward mounted seat bracket option. Riders shorter 5'-8" will appreciate the extended handlebars. They can be cut shorter if needed, but its not so easy to extend the standard bars. The longer moment arm will allow the rider to twist the bars in the clamps, so its a good idea to request an extra pair of clamps. The base level DD2 is a better choice then one would expect, although there is one fragile component that links the shift cable to the inside of the hub. They do require some adjustments periodically, we find about every 100 miles. That may be due to folding stresses on the cable. It is vital to precisely maintain the factory adjustments to keep it from an early expiration. However even with the DD2 most riders will still want at least two chainrings on the front as the range just isn't quite wide enough for most. Also if you do order the DD2 it will come with the wider 8-speed chain. In our case ordering both trikes with the DD2 we were able to get a $75 discount by leaving the Cranks off as we were installing our own. HPV doesn't give many discounts on deleted parts such as rear wheels - you can order at the frameset level but its not heavily discounted. Pay very close attention to the front/rear suspension-spring options. Its not difficult to change the rear spring however the front springs will take those without experience several hours to change out. HPV has done an excellent job matching the springs to the rider weight. The HPV Cargo Racks are very robust yet lightweight at just under 2 lbs. As the load is on the suspended side the further back weight is placed the more the rear will droop. Even with the Panniers in the pictures above, 30 lbs of groceries don't drop the ride height by more then about 1/2". With the Moonrider bags that are more forward placed, the droop will likely be about half that of a standard pannier. Moonriders are on my list of future accessories. There are various options for lighting that include routing the wiring through the frame. Its a very nice feature although it limits you to the lights supplied. The grommets are installed on the frame to allow internal routing if you choose to do so. We didn't bother with internal routing although may do so at a later date. We spec 'd Big Apple tires having enjoyed them on the Expeditions. If you ride on unpaved paths once in a while the Big Apples are a good option. If you ride only on the pavement, the Triker/Marathon Racer is a good combination. The suspension is just supple enough up front to soak up most the potholes without hammering the tires and rims, and the rear suspension keeps the Neckrest from hammering your neck. The standard Avid BB7 brakes come with parking brake latches a really nice feature, but do not have adjustable ranges. Shorter fingers may struggle a bit with getting the perfect fit. There are several adjustable mechanical levers that are suitable for shorter fingers costing about $30 per side. Although I prefer hydraulic brakes, we ordered our FS26's with the standard as we have several sets of the Shimano M785 brakes and may install them in the future, but frankly integrated the parking brake feature and leverage is just about right for us. Avid BB7 pads will be upgraded to EBC Gold which are squeak-free and more consistent. As far as the sheer joy of riding, these trikes are putting stretch marks on our faces from the Recumbent Grins we wear. Its a typical response from anyone who moves up, say from a Terratrike Rover to a Catrike Road or a Trident Spike to an ICE Adventure. During the order process I had a ton of questions ranging from how to get things to fit to specifics on component dimensions. Zach Kaplan had all the right answers. For example, fitting the Bottom Bracket with a daVinci triple requires an offset; Zach knew exactly what to do to make it right, along with experienced answers to all of my very detailed questions. All throughout the order process, Zach kept me informed of every update from manufacturing to shipping. Simply a super guy to work with. Texas has an 8% sales tax when items are purchased in state. Shipping from California was under $200. You can do the math on the savings. We'll do more updates on the HPV Scorpion FS26's as we put more miles on them.